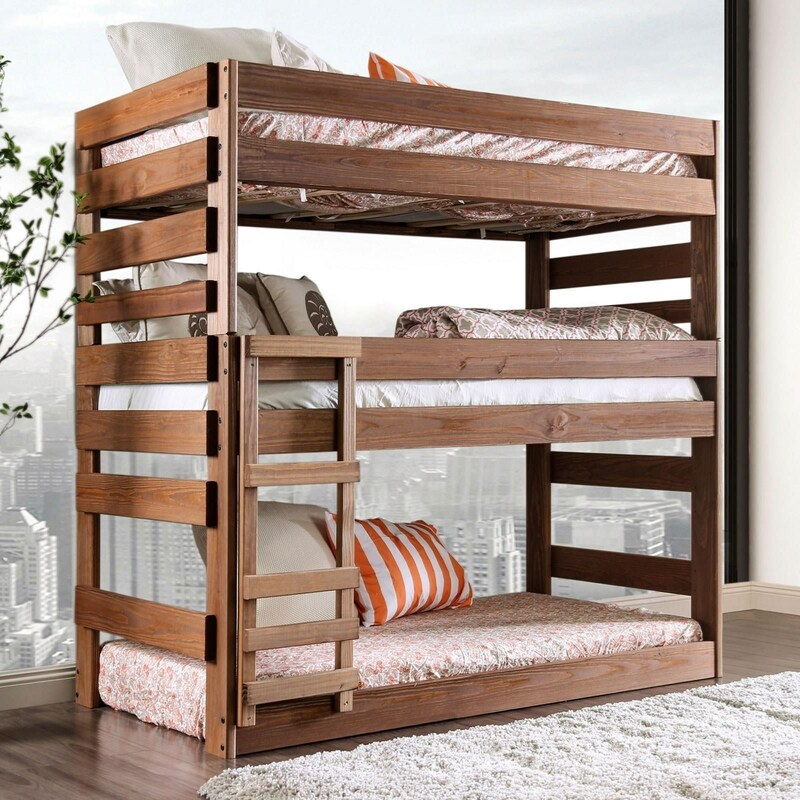 Trick your kids into thinking you made this triple-decker bunk bed. The plank design with visible bolting gives this piece a homemade feel but is sturdy and safe. Your kids will love the headboard and footboard ladder, and you’ll love the large plank guard rails. Beautiful natural wood hues turn this kid’s bed into a sophisticated piece. Slats or Bunkie Board Required (sold separately). The Pollyanna Twin Triple Decker Bed by Furniture of America at Rooms for Less in the Columbus, Reynoldsburg, Upper Arlington, Westerville Ohio area. Product availability may vary. Contact us for the most current availability on this product. AM-BK500-1 Component 1 1 0" 0" 0"
AM-BK500-2 Component 2 1 0" 0" 0"
AM-BK500-5 Component 5 1 0" 0" 0"
AM-BK500-3 Component 3 1 0" 0" 0"
AM-BK500-6 Component 6 1 0" 0" 0"
AM-BK500-4 Component 4 1 0" 0" 0"